Posted by Shawn Kriewaldt. on Friday, February 12th, 2016 at 1:45pm. When is the best time to list your home on the market? This is a very common question. To answer, let’s discuss how many offers get accepted each month and which months have the most real buyers. According to data from SCWMLS, April has the highest number of accepted offers, when 796 homes were received accepted offers. But the real upward trend begins in March, when 789 homes went under contract, nearly as many as April, and in May 760 homes went under contract before beginning to subside in June. 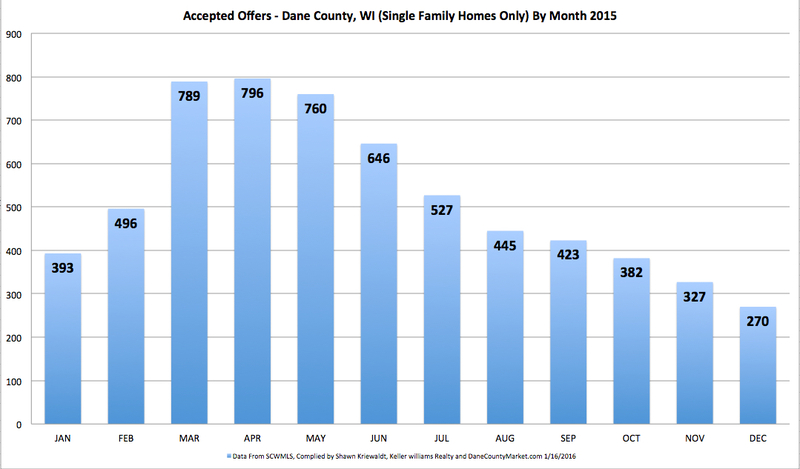 There is another decrease in July, where 527 homes reached agreement, before dropping off significantly in August. As the data clearly suggests, the spring is the best time to list. As new buyers come onto the market, they can choose your home. You don't want to get your home on the market after the spring surge in buyers and, consequently, languish on the market. If you want to get maximum exposure, it's best to list your home as soon as possible. If you can get your home listed by the end of February or early March, it would go a long way in help you get the best results for your home sale. To learn more about our current market, give us a call or shoot us an email. We would love to help you make informed decisions in our marketplace!